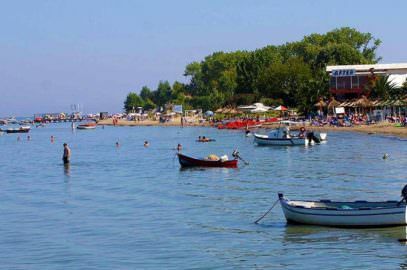 Perama is located on the eastern side of Corfu, about seven kilometres south of the town of Corfu and just opposite the Mouse island and is connected with Kanoni by a pedestrian bridge. It is the seaport of Gastouri since most properties here belong mainly to residents of this mountainous village. 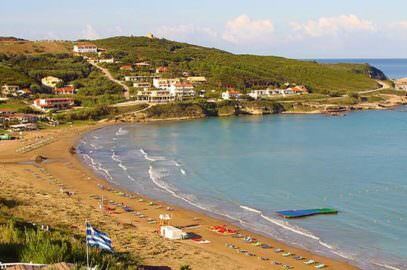 The site covers an area of ​​about 5 km along the highway, starting from Karidies area 5 km from Corfu and reaches up to the Kaiser Bridge 2 km from Benitses . The Kaiser’s Bridge was connecting the pier with a small road up the Achillion Palace and was built by the last private owner of Achilleion, the German royal family in the early 20th century, blown up again by the Germans during the German occupation for their military vehicles to pass underneath!! 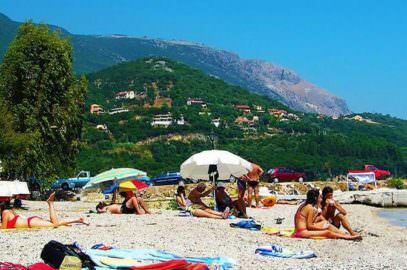 Perama is a popular seaside tourist resort since many decades, especially during the 80s and 90s, today the area still has many hotels and accommodation, surrounded by olive groves and boasts several beautiful pebble beaches. Has the privilege of the best possible view to the Mouse island and the monastery of Vlaherna also some restaurants and bars at the beginning of the bridge to Kanoni are the best places to watch plane landings and take-offs to and from Corfu Airport. Most visitors to Corfu pass through Perama, although nowadays fewer stay there than in the 80s when it was one of Corfu’s most popular resorts. Situated between Corfu Town and Benitses several of its hotels and coffee bars enjoy uninterrupted views of Corfu’s most photographed sight- Mouse Island (Pontikonissi). 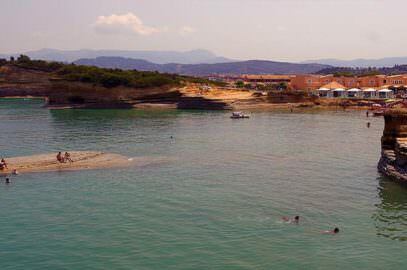 Local residents may try and tell you this island is Ulysses boat, turned to stone- although another islet off Corfu’s west coast also claims the same thing! Be that as it may the island is stunningly beautiful, topped by a small church where weddings and christenings are still celebrated. Energetic people can swim over to the island, but boats can also be hired. On the causeway joining Perama and Kanoni there are usually fishermen casting a line into the sea or the lagoon, and keen plane spotters also, because the end of the runway is only a few metres away. Despite being busy it is also a popular place for an evening stroll, and also for motorbike riders taking a short cut to Corfu Town. Below the causeway runs the vital pipeline put in in 1850 to bring water from the hills above Benitses to Corfu Town. Uphill from Perama a very attractive country lane winds its way past small chapels, and historic houses to the village of Gastouri, where the Achilleion Palace is situated, It is shaded by large trees, and makes a pleasant walk even in summer. A less well known walk is to the old aqueduct, built by the British and still in use today, not easy to find but well worth the search. Durrell enthusiasts also know that Gerald Durrell stayed in two houses at neighboring Cressitha (Chreseeda), neither open to the public. The abundant wildlife in and around the lagoon was a constant source of inspiration to the young naturalist, and there are still older residents who remember him with great fondness. A walk over the causeway to Kanoni provides quick access to Corfu Town, without having to go all round the perimeter of the airport- you can either walk the whole way to town(about 30 minutes) or pick up another bus from the promontory. 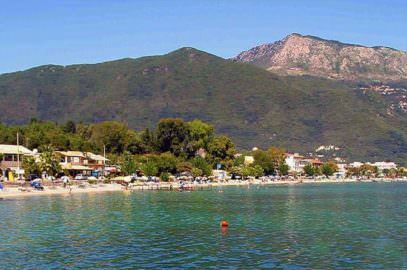 Perama is also on all bus routes to the south of the island, Messonghi, Issos, Vitalades, Lefkimi and Kavos are all accessible from the bus stop and the local bus which goes between Benitses and Corfu Town goes very frequently. 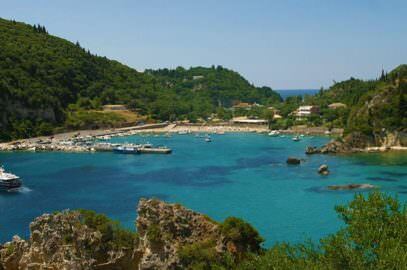 The rest of the island can be easily accessed from Corfu Town. The beaches in Perama are small but rather spectacular as the hills are steep and quite dramatic. It is necessary to be a reasonable walker to get up and down though, however there are many nearby beaches to which you can either walk or take a bus. 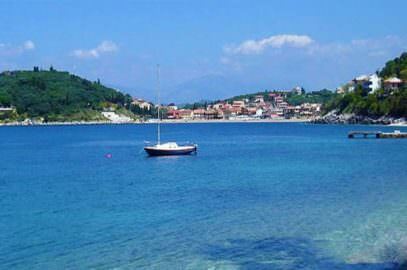 All in all Perama makes an excellent base for those wishing to explore the island. Transport links are excellent, there are numerous interesting walks in the local area, and access to Corfu Town is easy even on foot. It is not the ideal resort for those seeking a beach holiday, but for those with more active interests it is perfect.